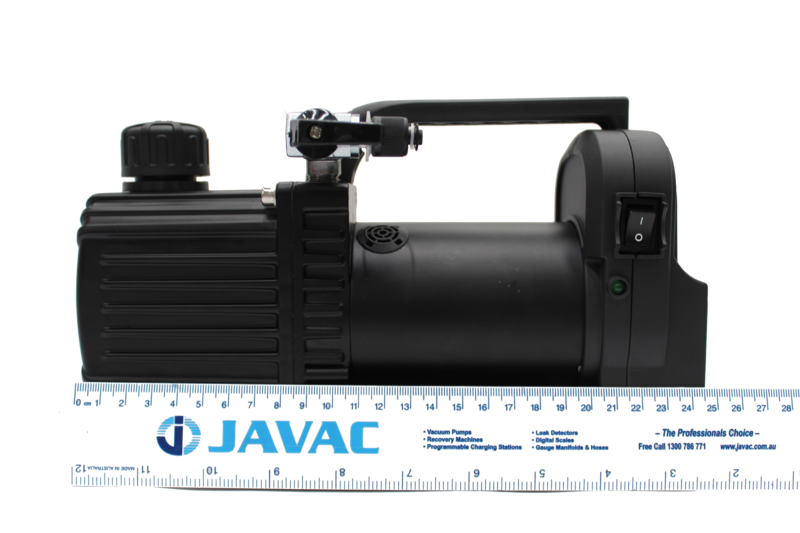 JAVAC have now released its first 18v Battery Operated Vacuum Pump (Skin ONLY). It is the ONLY 2 STAGE battery operated vacuum pump out in the market. A 2 stage vacuum pump is what the majority of contractors use as it pulls down to a deeper vacuum. This is the perfect vacuum pump for doing residential splits, small commercial service and installs, and also for automotive A/C charging where power supply can be an issue. The pump comes with standard AEG ready battery fitting. These vacuum pumps have been tested with a fully charged 4ah AEG battery (standard battery connection), lasting an impressive 50 minutes which is more than enough time to carry out an install or service. The pump comes with a shut off valve in order to avoid oil backup into the charging hoses and contaminating the system, and potentially ruining your manifold. As well as the shut off valve this Javac Pump also comes with a gas ballast valve which makes this the only cordless pump to do so. The function of the gas ballast valve is to enable condensable vapours to be discharged through the pump with minimum oil contamination, depending on the nature and quantity of the vapour(s) involved. JAVAC can supply adapters at an extra cost which allows you to use either Bosch or Makita 18v batteries, so if one battery goes flat then another brand can be used. Special air passage is designed to prevent pump oil from returning to contaminate vacuum vessel and pipeline after the pump stops. The product has a built-in device to eliminate oil mist and an oil-gas separator at air exhaust outlet to treat with oil contamination in air exhaust. The motor and pump are integrated to make the pump more compact, simple and robust. The CDC-30 has a DC Motor, and runs with an 18V battery which can be used in a no power supply environment. This product is especially designed for low temperature conditions to guarantee normal starting in winter (³5°C temperature). The product runs with extremely high ultimate vacuum and low noise.